The recommended dosage 5mg per pound of body weight administered twice daily for 5 to 7 days or 48 hours after all symptoms have subsided. If no improvement is noted in 5 days, the diagnosis should be reconsidered and therapy changed. 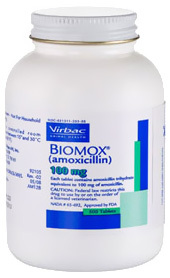 PRECAUTIONS: Until adequate reproductive studies are accomplished, Biomox® (amoxicillin) tablets should not be used in pregnant or breeding animals. Klebsiella and all strains of Pseudomonas are resitant. Amoxicillin may be given without regard to meals because it is stable in gastric acid. It is rapidly absorbed following oral administration and digguses readily into most body fluids and tissues. It diffuses poorly into the brain and spinal fluid except when the meninges are inflamed. Most of the amoxicillin is excreted in the urine unchanged. CONTRAINDICATIONS: Use of amoxicillin is contraindicated in animals with a history of an allergic reaction to penicillin.